Star guest at the second edition of Tenerife’s International Film Music Festival (Fimucité) taking place from 23-29 June is Spanish composer Fernando Velázquez, winner of the Spanish Music Awards best soundtrack of the year for the film The Orphanage (El Orfanato), following his nomination in the same category for Spain’s Goya Awards. 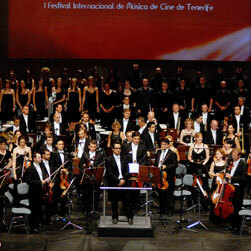 Velázquez, who hails from Vizcaya in northern Spain, will open the programme of concerts scheduled for Filmucité 2008 as conductor of the Tenerife Film Orchestra & Choir with the world premiere of his Symphonic Suite for The Orphanage, Spain’s biggest box office hit of 2007 and the European film which ranked fifth on the continent for the number of cinema goers it attracted. This edition of the festival also pays tribute to the original soundtrack of one of the most important films in the history of movies: Stanley Kubrick’s 2001: A Space Odyssey to mark the 40th anniversary of its release. The closing concert will feature the Tenerife Film Orchestra & Choir playing a selection of musical scores by the composer Alex North, classed as a masterpiece nowadays despite being cut from Stanley Kubrick’s final version of the film. The first edition of the Tenerife’s International Film Music Festival attracted composers of the stature of Don Davis (Matrix), Sean Callery (24), Mychael Danna (Monsoon Wedding), Ángel Illarramendi (Los Borgia) and Diego Navarro (Oscar a Surrealist Passion).